U.S. Senate candidate Jim Renacci addresses Republicans at the GOP headquarters in Hillsboro on Thursday. U.S. Sen. Sherrod Brown (D-Ohio) is an “obstructionist” who votes against the interests of Ohioans in favor of Democratic leadership in the Senate, his opponent charged Thursday in an interview with The Times-Gazette. 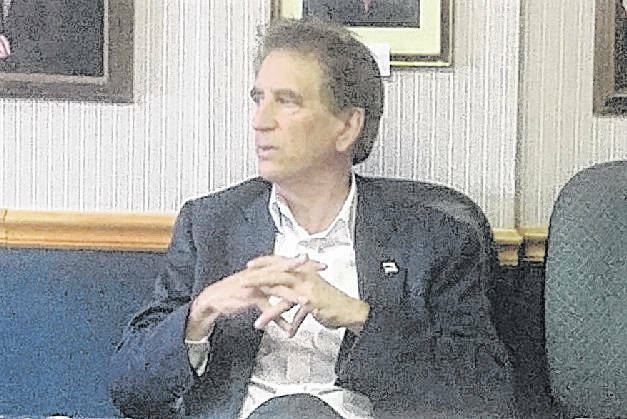 U.S. Rep. Jim Renacci (R-16th Dist.) is challenging Brown in the November election, having defeated businessman Mike Gibbons in the May 8 primary. Renacci, serving his fourth term in Congress, is an unabashed supporter of President Donald Trump, and touts his relationship with the president and his confidence that Trump will campaign for him in the Buckeye State in the months leading up to November. Renacci said he was the first national politician to endorse Trump during the 2016 primary. Renacci, who initially announced a run for Ohio governor before deciding on the Senate race after state Treasurer Josh Mandel withdrew, said internal polls show him in a neck-and-neck race with Brown, who has served in the Senate since 2007. Renacci, 59, positions himself as coming from a working class background, his father having been a “union railroad worker,” as Renacci put it, and his mother a nurse. He worked his way through college – the first in his family to earn a college degree — while Brown was the son of a doctor who graduated from Yale, said Renacci. “We need to put people in who have lived in the real world,” said Renacci. Renacci said he has a 100 percent voting record on Second Amendment and pro-life issues, but also stressed his history of working in bipartisan fashion. “We don’t have Republican problems or Democrat problems, we have American problems,” he said. Renacci said he participates in bipartisan breakfast meetings in Washington, and has had “at least” 15 bills passed by the House with bipartisan support. He said in 2012 his bills passed with 100 percent bipartisan support, and in past elections he has been endorsed by both the Tea Party and the Teamsters. Maddock said Renacci’s criticisms of Brown are designed to “paper over the fact” that Renacci has spent his life in business and politics “looking out for himself,” while Brown works each day on behalf of Ohio workers. Brown “says what he means, and means what he says,” said Maddock. Renacci said those developments motivated him to run for Congress. Renacci has historically been a supporter of free trade, but he said Trump’s tariff threats and actions shouldn’t be judged until more time passes. He said China has “broken the rules” and the president has to address the problem. Renacci said he understands worries by farmers and manufacturers about tariffs. But he said Trump often starts with a broad approach, then pulls back. In the wake of various race-related controversies – the latest just this week involving a tweet from comedienne and Trump supporter Roseanne Barr about former Clinton aide Valerie Jarrett that was widely condemned as racist — Renacci said criticism that Trump lacks sensitivity on racial issues is unfounded. “I think he has a sensitivity,” said Renacci. “I’ve sat in a car with him, had one-on-one discussions. He understands.” He said the national media “misjudges” the president. Renacci said that both Trump and Vice President Mike Pence called to congratulate him on primary election night. He said Ohioans will see more of them on his behalf as the campaign progresses. Earlier Thursday, Renacci attended a meet-and-greet at Highland County Republican headquarters. Renacci and his wife, Tina, reside in northeast Ohio and are the parents of three children. https://www.timesgazette.com/wp-content/uploads/sites/33/2018/05/web1_Renacci-Hillsboro-5-31-18-this-2.jpgU.S. Senate candidate Jim Renacci addresses Republicans at the GOP headquarters in Hillsboro on Thursday.